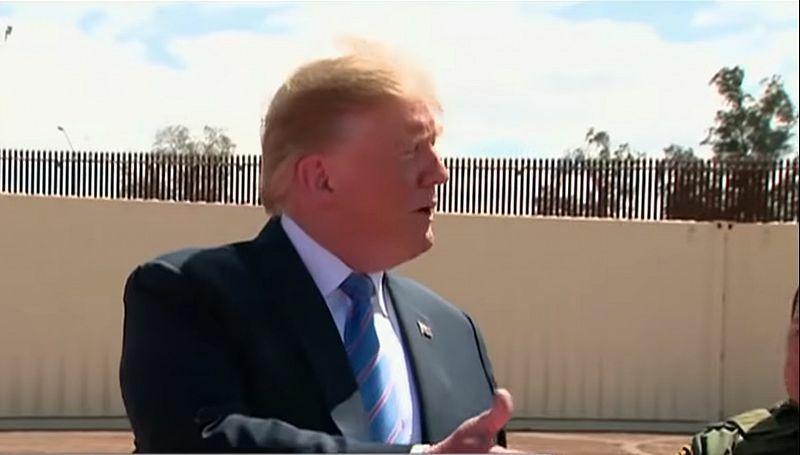 Donald Trump at the U.S.-Mexico Border Wall (screenshot via YouTube). “It’s time to build a wall”, as infamously said by Donald Trump, has sparked debates all around the world about the issue of immigration. Immigration is the act of moving from one country to another. The reason for people wanting to immigrate to a different area can be split into two influential factors; pull and push factors. Pull factors are the things or prospects which are considered desirable and attractive to the individual, giving them the impression that by moving they can finally possess or own them. These include: greater access to resources, a desire for economic prosperity, to find and engage in paid work, better their standard of living, better education and safer living space or environment. Push factors, on the other hand, are the things or opportunities that compel the individual to move. due to them believing that if they continue to reside in that country they would be at risk of losing something valuable, possibly even their life. Examples of push factors include drought, extreme religious activity, famine or conflict. Although the act of moving from one country to another seems simplistic, it can have a huge burden on a country’s economy, raising the question of whether the country should allow the flow of immigration or put Australian needs first. This is where Australian political parties come in. Different parties share similar or different beliefs on the issue of Australia’s immigration. The left side of politics: the Labor Party and the Greens, are pro-immigration. On the other side of the spectrum, the Liberal Party and Pauline Hanson’s One Nation have stricter policies on immigration, believing the Government’s priority should be to create and sustain a better life for "Australians". Due to the varying opinions, the Australian public is split. The question remains: "What direction should Australia take?" The Greens are the most pro-immigration party. They hold that we should take a compassionate approach to refugees, opening our arms and embracing them rather than sending them astray. They also believe we should create pathways for those that need our help. Toni Payne, a figure in the Green Party in NSW, claims that if the Greens win the Federal Election they will end offshore detention on Manus and Nauru islands; increase humanitarian intake to 50,000 per year compared to the previous 17,555 which was recorded between 2015-16; and abolish temporary protection visas, reintroducing permanent visas for refugees. They will also introduce a seven day limit for onshore detention to combat the unfair treatment and belittling of the refugee populations, who are kept in inhumane and cramped conditions. Another party which views are not dissimilar is the Labor Party. They agree with the Greens that the procedure and processing of refugees through Manus and Nauru is long overdue and that if elected they will provide permanent protection and a pathway to citizenship that they have waited over a decade for. Though they have limits on what they will do for refugees. This belief is becoming very popular as it understands the financial restraint immigration has on the economy. However, it does allow for the chance for individuals seeking a better life to one day earn citizenship in Australia, a country that prides ourselves on our diversity. On the other side, we have the Liberal Party and Pauline Hanson’s One Nation. The Liberal Party’s site describing their immigration policies depicts refugees as beholden to "people smugglers" generalising the group as posing a risk to Australia's security. They claimed to have taken back control over their borders, as well as sending boats carrying illegal immigrants back when it is safe to do so. The next party, known for its controversial policies is One Nation. Similar to the Liberal Party, they believe that immigration is in dire need of restriction and control and that we as country should have the right to control who enters and exits our country. They also claim that immigration is at its highest, with 60% of population growth being through immigration. However political parties aren’t the only group of individuals who have their own views and perceptions on the issue of immigration in Australia, we also have the individuals who bare the consequences of the decisions. It is becoming evident that some Australians are slowly beginning to be disillusioned with the influx of immigrants. A poll taken in 2018 indicated that an increase of 14% of the population feel immigration growth is increasing at an exceedingly rapid pace. Although this statistic would give a pretty good outline to where us Australians sit on the immigration continuum, a different poll discussing multiculturalism and cultural diversity and its impact on social and economic lives shows another set of results. That poll claims that 55% of the population believes that immigration enriches our social and economic lives, whereas 32% of our population feels that it doesn’t enrich our social and economic lives, but rather poses a detrimental factor, causing us as a society and economy to not be able to progress and grow and the remaining 13% not having an input at all. Because of these statistics we get the strong impression that most Australians feel that immigration has a significantly positive influence on their social and economic lives; that we as a collective group can understand that this influx of new immigrants aren’t just a financial strain. But that, in the long run, can have a prosperous on our country’s growth and prosperity, as well as providing diversity and enriching our culture. Overall it is clear that we as a nation are still divided by the issue of immigration, as political parties continue to fuel their campaigns off our division, which has resulted in an even more distant separation. However, from the statistics gathered it is clear that we as Australians are mostly pro-immigration, which ironically "butts heads" with the Liberal Party who currently hold Government. It is only until the political party who properly represents Australian beliefs comes into government that will we see any unity positive change. Harry Eaton is a Year 11 HSC student.